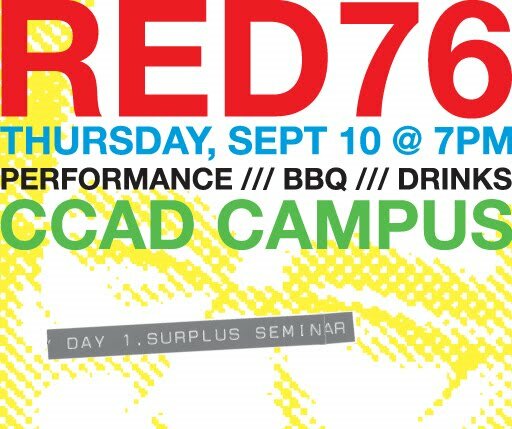 On Thursday, September 10 Red76 kicks off Descent to Revolution and their month-long stay in Columbus with a performance/BBQ/drinks in a CCAD campus PARKING LOT. Red76 cohort Gabriel Mindel Saloman, one half of the seminal, now defunct, noise band Yellow Swans, will perform a set under the banner of his new solo project, Sade/Sade. For this performance Sade/Sade will use found cassette tapes, manipulated, tweaked, and processed to make its music. The Canzani Center Gallery will act as a reading room and point of the departure for the exhibition.